Introduction Patients with advanced COPD have difficulty articulating their support needs to clinicians, undermining person-centred care and support. A new approach, the Support Needs Approach for Patients (SNAP), informed by, and modelled on, the evidence-based Carer Support Needs Assessment Tool (CSNAT), may enable patients to identify and express their support needs and start person-centred conversations with clinicians. 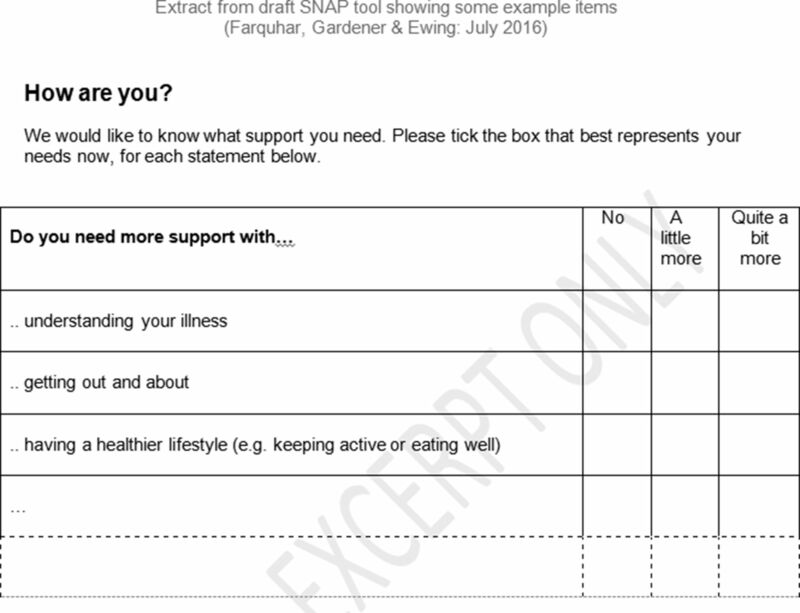 SNAP is underpinned by an evidence-based tool (a brief set of questions) to help patients consider and express their support needs. This study aimed to develop the SNAP tool, suitable for use in clinical practice. Methods Two-stage qualitative study. Stage 1: domains of support need in advanced COPD were identified through a rapid review of the literature, analysis of data from the Living with Breathlessness Study (n = 20 purposively sampled patients with advanced COPD) and patient focus groups. Stage 2: the draft SNAP tool was developed based on the identified domains of support need, then reviewed and refined in stakeholder workshops with patients, carers and clinicians (from primary, secondary and community care, including specialist respiratory care) to ensure acceptability and suitability for clinical practice. Results A comprehensive range of evidence-based domains of support need were identified in Stage 1 which were then formulated into questions for inclusion on the draft SNAP tool in Stage 2. The draft tool asks patients to consider whether they need more support in relation to 16 broad areas (domains) of support need such as practical help in the home, knowing what to expect in the future, understanding their condition, getting out and about, and support for their carer. Patients, carers and clinical stakeholders from community respiratory care endorsed the content and wording of the draft SNAP tool and the proposed Support Needs Approach for Patients which it underpins (forthcoming workshops with primary and secondary care clinicians will identify their views which will also be reported). Discussion The SNAP tool has the potential to help patients with advanced COPD identify and express their support needs to clinicians in order to enable delivery of person-centred care. Future work will test the tool’s validity and feasibility of use in everyday clinical practice.